But prior to this system Jamie has actually released several other money-making programs – however sadly most of them (in my opinion) didn’t really live up to their bold claims… So will this one be any different & can we actually make money with it? Or is Profit 365 a scam that’ll just see us wasting even more money on training that won’t really help us profit? What Exactly Is The Profit 365 Program? 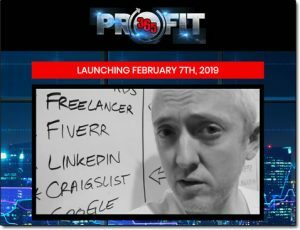 Now I can tell you on that front is that when it comes to making money online & marketing things, Jamie Lewis is the real deal – he’s at expert at it & there’s absolutely no doubt he’s made a fortune over the years. 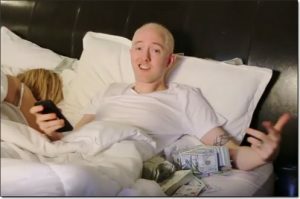 However sadly when it comes to helping others make money online this is where (in my opinion) things fall down a bit with him. I mean don’t get me wrong like I say he’s an expert, and he’s a funny guy – I always find his videos entertaining, and he does actually put out pretty good training… But unfortunately as far as I’m concerned he just hypes things up WAY too much. You see he recently put out a couple of other programs named the Wealthy Agency & Profit Injector & to be honest the programs themselves weren’t too bad. 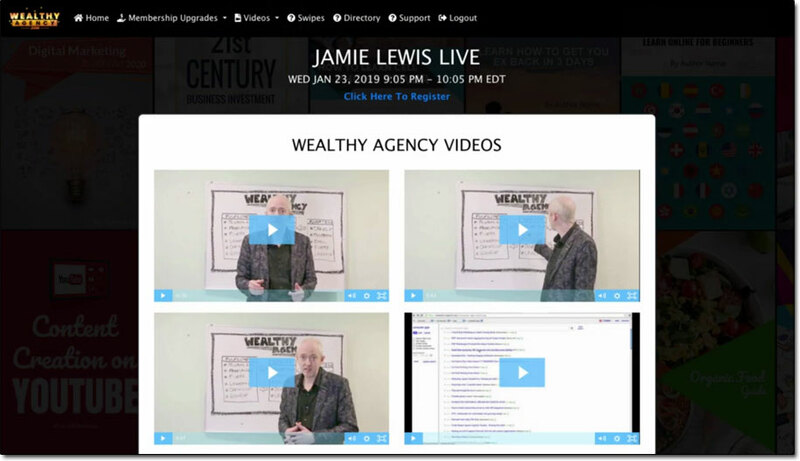 I normally expose a lot of scams here & they were by no means scams – they contained pretty decent training & they were built around methods that could work… However Jamie made things seem WAY too easy in his promo videos for them. He kinda almost led people to believe that they could just sign up, do nothing & become rich… They were sold as almost automated systems (in my opinion) – or at least that’s the way they were portrayed to me anyway. And whilst there are several good ways to legitimately make real money online, sadly the internet is not magical & none of them are going to see you getting rich with doing to little to no work… So typically you should run away from anything that promises such. However here we are again with Profit 365, another one of Jamie’s programs that in theory could work – but sadly has been hyped up way beyond reality once again which is just pretty disappointing to see. The whole thing is built around something called affiliate marketing, which is a legitimate way to make money – and as you can read about here it’s a VERY good way to make money… However it takes a lot of work to succeed with it. It’s not a “push button profit” thing like the Profit 365 system almost makes out it is. And then there’s the fact that Profit 365 costs money to join, yet there are other places you can start with affiliate marketing for free – like Wealthy Affiliate. How Does The Profit 365 Program Work? Currently he’s just opened the website up to affiliates, which means he’s opened it up so that other marketers can get their stuff ready to promote it online (and they’ll earn commissions on any sales they make). So if you signed up to Profit 365 and you had clicked through my link to go there, I would earn a commission… That’s how affiliate marketing works (as shown below) but don’t worry, I’m not affiliated with Profit 365 so I’m not interested in getting you to sign up or anything like that. I only ever affiliate myself with things I’ve tried & know that they work or that they will provide my readers will value… And by the way like I said above if you’re interested in earning affiliate commissions yourself then be sure to check out the free Wealthy Affiliate training on how to get started. But anyway the reason I’m telling you that is because the Profit 365 program isn’t live yet so I can’t tell you exactly what it entails, however I can tell you that from what I’ve seen it looks to be kind of a “bundle” of his Profit Injector & Wealthy Agency programs. So my suspicions here are that the Profit 365 program is nothing new as such & that instead it’s just going to be a re-hashed “bundled together” version of his Wealthy Agency & Profit Injector programs, sold under a new name. But again I must state that at this point these are only my suspicions and I’ll definitely take another look at it once it’s actually launched to see what’s going on for real, however it’s safe to say I don’t have my hopes up too high. I mean like I mentioned earlier in this review Jamie sure as heck knows his stuff & unlike most of the scammers out there he does actually put out some pretty decent quality (and entertaining) training in his programs… It’s just the way that they’re sold which I feel is the issue. More often than not they’re super hyped up, and also more often than not they contain “hidden” upsells once you get inside. I would really love to actually see this guy just put out a legit, down to earth course because he definitely does know a thing or two & honestly if his sales pitch was totally upfront I’d probably share his training with others. 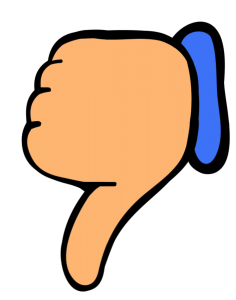 My Verdict – Is Profit 365 a Scam? Well obviously like I mentioned above the program itself hasn’t been released fully to the public yet – it’s just for affiliate access at the moment so I can’t really make a definite verdict here… However based on my suspicions & my experience with Jamie’s past programs I am going to say that it probably won’t be a scam, however at the same time it is likely to be way overhyped. What I mean by that is that the program when it launches will likely make it seem like you can earn lots of money really easily even if you’re brand new to online marketing. He might say he has some trick or method that will get you moving fast (as that’s the general approach he takes) and whilst that might sound good in theory, in reality it’s only half true. You see the truth is that Jamie’s methods do work. His Wealthy Agency method was based around a method that I myself personally used in the past, and a method that Tai Lopez also touches on in his Social Media Marketing Agency program… However the big “but” is that whilst Jamie’s methods do work, they are not as easy as they are made out to be. They take a LOT of work to see success with. Plus his programs quite often contain “hidden” upsells on the inside, so whilst you might buy in for a certain price thinking that you have access to everything, often you are left to find out the hard way that you haven’t & that you actually need to spend more once again. That’s something I really don’t like… I mean I don’t mind extra costs, just as long as they’re made transparent before hand (which usually in the case of his programs they’re not). So overall in my opinion whilst Jamie’s programs are “technically” legit (and could work if you work), I personally believe there are better alternatives out there especially if you’re brand new, like Wealthy Affiliate – which is free to join & one of the best places I’ve ever come across for learning how to make money online. Is Bitcoin Advertising a Scam? My Honest Review Exposes It! Super Sales Machine Review – Scam System or Legit Way To Make Money? Is Bitcoin News Trader a Scam? My Honest Review Exposes The Truth About It! Online Sales Pro Review – Is This New App The Answer To Easy Online Riches? 4 Responses to "Profit 365 Review – Scam By Jamie Lewis? Not Really But You’ll Want To Read This…"
I really have no idea where to begin. But I need to provide and income that is legitimate and viable… I am desperate for help… as I’m sure a lot of people are! Well to start with I’d recommend checking out my top picks here – those are the best legitimate ways for generating an income that I’ve come across over the years. If you’re in a “desperate” situation though then maybe the internet isn’t the answer right now – maybe a job would be better suited for now & then you could look at getting started online once you’ve found your feet & got a more stable income supporting you. There is nothing online that will provide good money quickly & anything that promises it is likely trying to scam you. Thank you for the review, and no I don’t have any further questions you answered them all already. Thanks.